Blueberries are one of the easiest fruits to work with when it comes to canning. Basically all you have to do is wash, sort, blanch, and can. There is no peeling, cutting, coring, or pitting. They are even easier to freeze because prior to freezing you should not even wash them. Just bag ’em, label ’em, and freeze. It doesn’t get much easier than that. Homemade blueberry pie has always been a bit of a thorn in my side. For some reason, no matter how much flour or corn starch I used, the pie was runny. 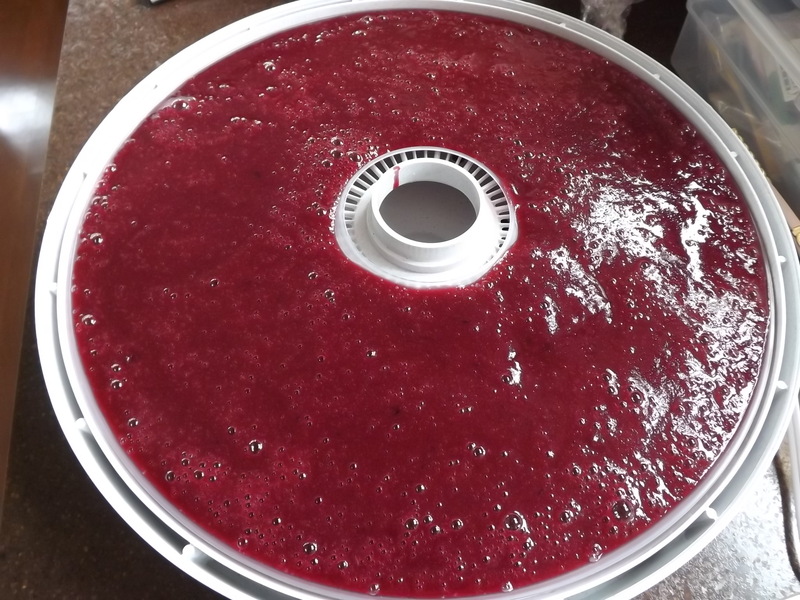 After the first piece of pie was removed from the pie plate, all the blueberries would fall into the open section and the amount of juice that was produced when baking would overflow the dish. My pies looked nothing like those beautiful magazine advertisements for “Perfect Blueberry Pie.” My pies were anything but perfect! To remedy this faux pas with blueberry pie, I decided to give Clear Jel a real test. Although I have been using it for several months with great success, all the fillings that I have made were ones that had never caused me the type of grief blueberry pie has. This was the first real test to see if Clear Jel could live up to all its hype. Wash and drain blueberries. Blanch fresh blueberries in boiling water for one minute. Drain and set aside. 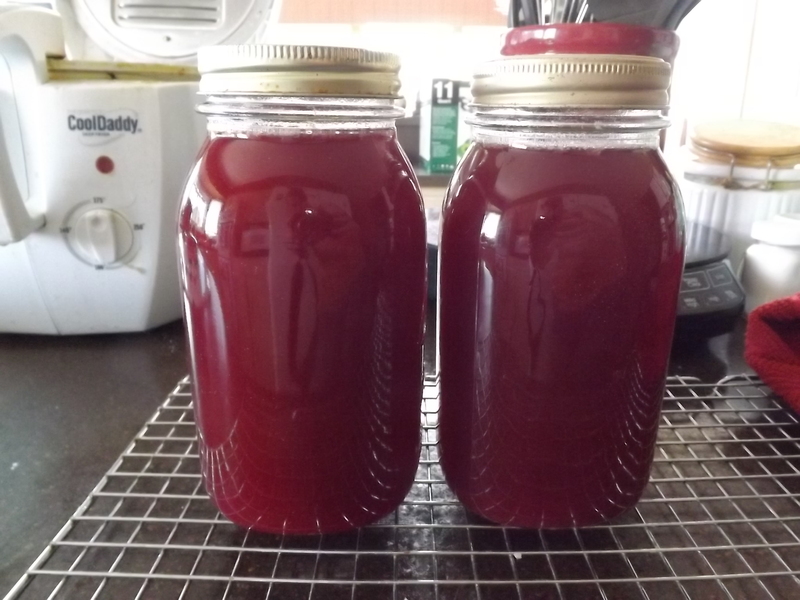 Combine sugar, Clear Jel slurry, and water. Cook on medium-high heat until thick and bubbly. Add lemon juice and boil one minute more. Remove from heat and immediate add blueberries and stir to combine. 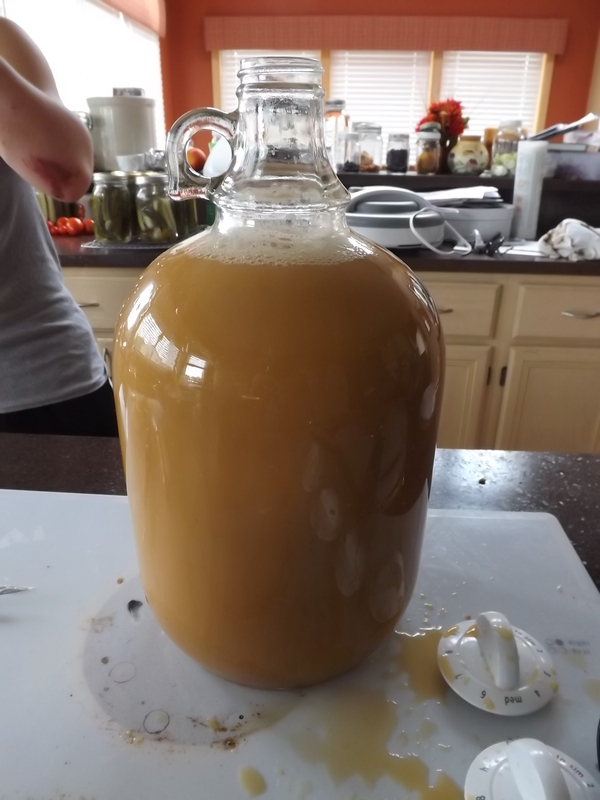 Ladle hot filling into hot jars leaving 1″ head space. 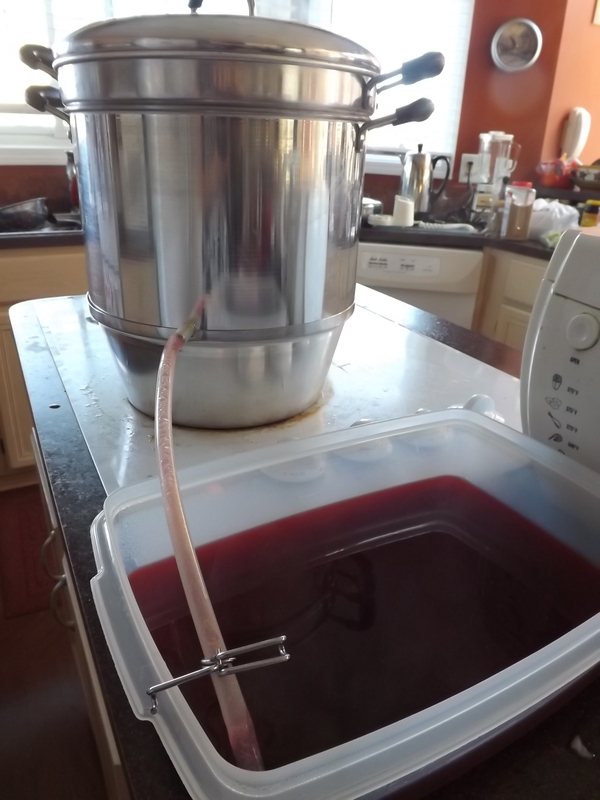 Wipe rims, set lids and bands, and process in water bath for 30 minutes at full boil. 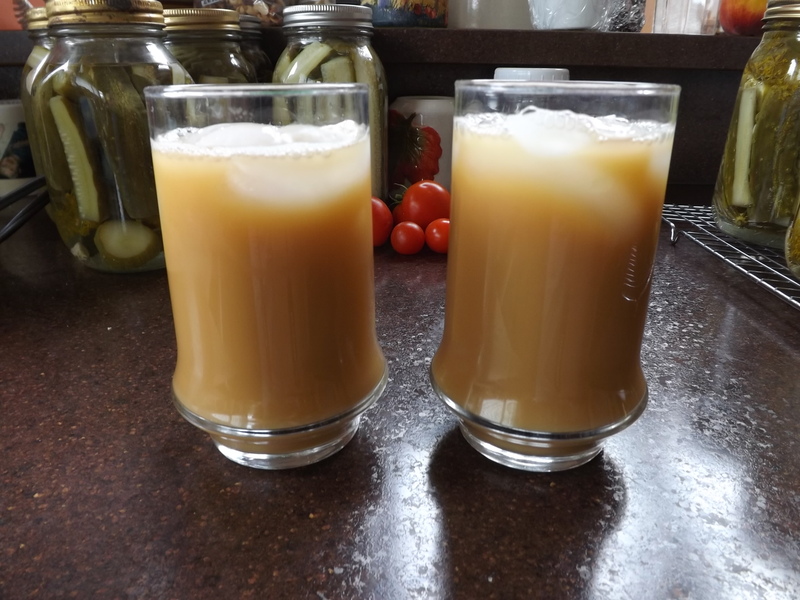 Once I’d made a batch of this and let it set overnight, it was time to give it a try. 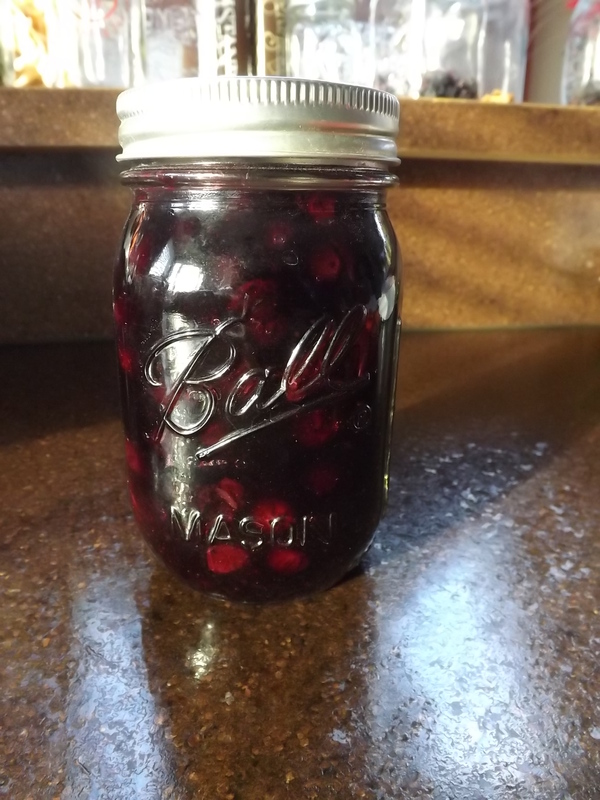 Seeing as if the pie filling were baked in a pie and then cooled it would no doubt be the same consistency as what was in the jars, I decided to use a jar of filling for blueberry shortcake. The filling was thick and very tasty. 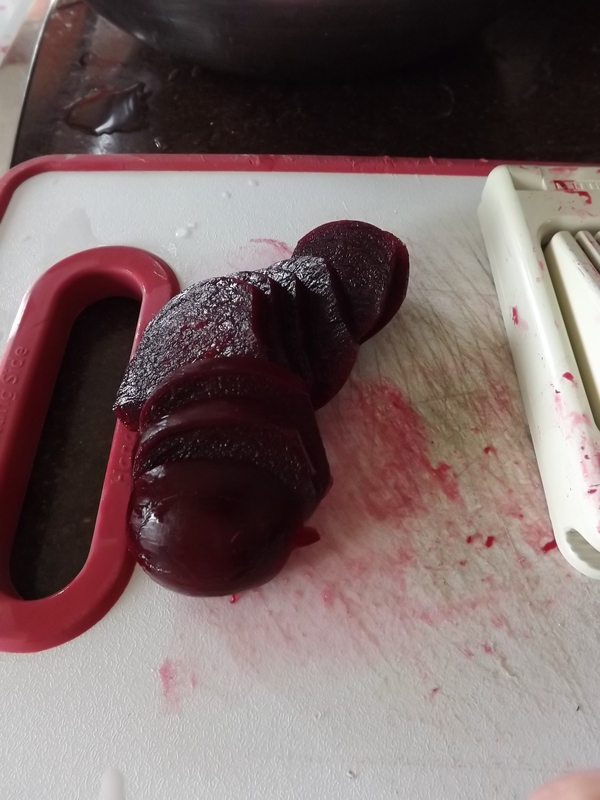 It was not runny in the least, and the flavor — well lets just say I’d have a hard time telling the difference between eating a handful of blueberries and eating a spoonful of filling. A lot of times what sounds or looks good on paper doesn’t necessarily translate into something that will work in the real world, thankfully this was not the case today. Clear Jel certainly lived up to my greatest expectations, and for this I am — Simply Grateful. One of my favorite ways to use up extra melon, leftover pulp, and over-ripe fruit is to make fruit leather. 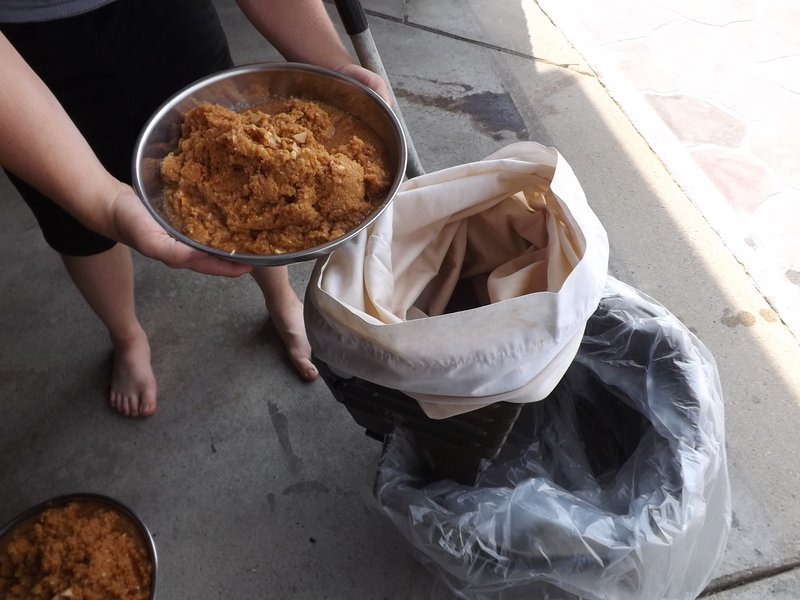 It started about a year ago with tons and tons of plum pulp, continued with pineapple and berries, and finally evolved into peaches (with the skins on, of course). This is a great way to make a sweet snack that is nutritious and healthy that I don’t mind the kids eating whenever they want because I control the amount and type of sweetener used. Pretty much all the fruit leathers I make require only two ingredients: Fruit pulp and honey or sugar. Some of the fruits don’t need a sweetener, while others need just a small amount. Peach (with peel) pulp with sugar to taste. Blueberry with honey to taste. 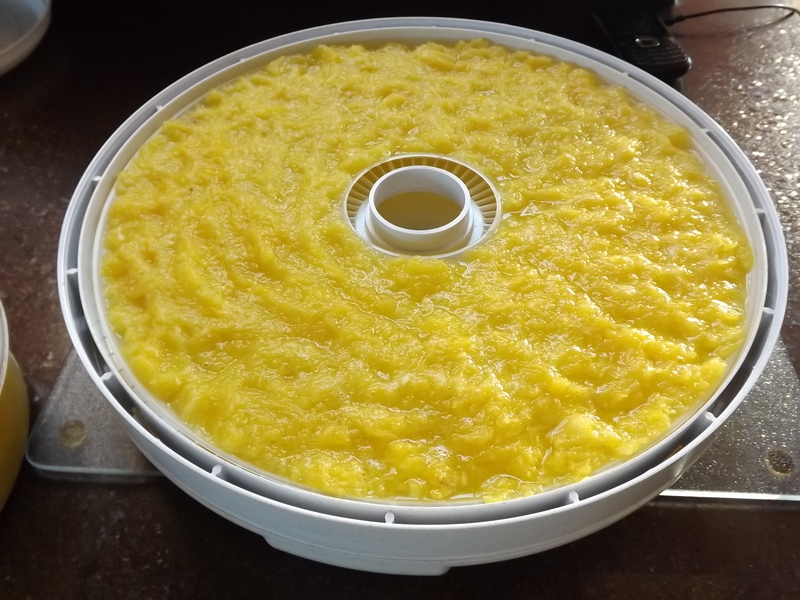 Pineapple – pureed, no sugar. Almost any fruit can be used for fruit leather as long as the water content is not extremely high like watermelon. 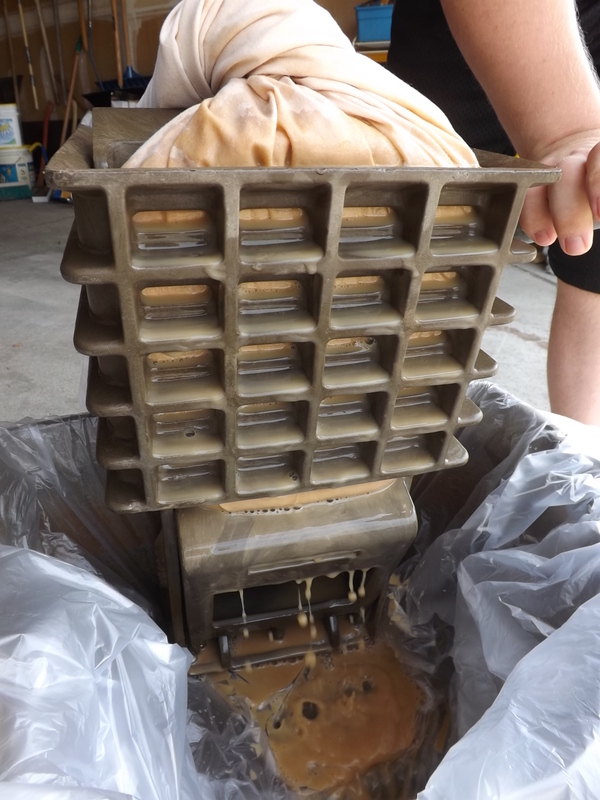 I know some people have made fruit leather from watermelon juice, but I have not had much luck with that. 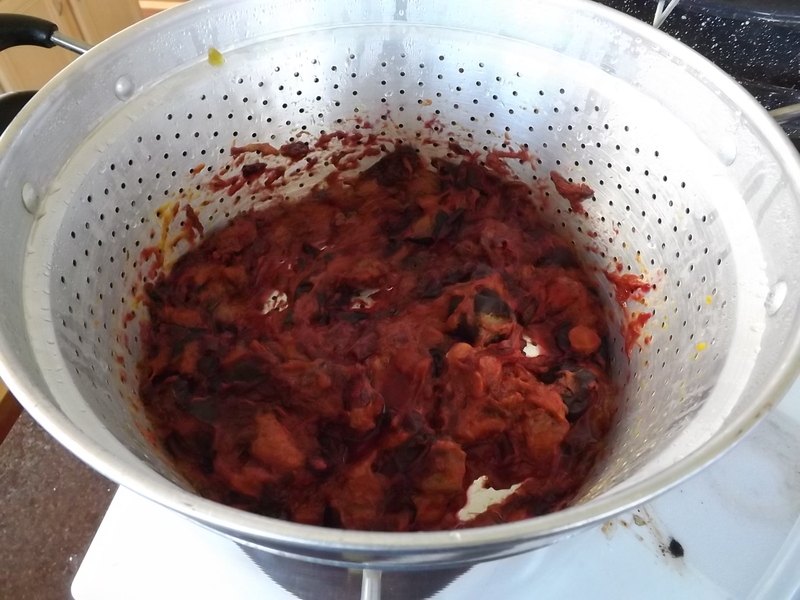 Using up all the fruit remnants from my canning is important to me because I hate to throw anything out. 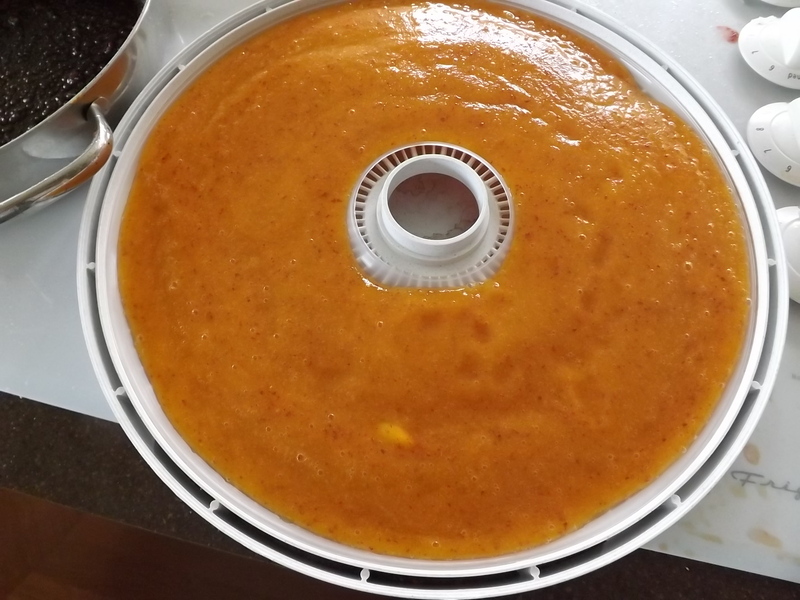 Dehydrating fruit pulp is one quick and easy way to do this and for this I am — Simply Grateful. I am not a lazy person by nature, but when I can find a way around doing “a lot” of work, I am most definitely going to do it. The Michigan peaches that I was fortunate to find were semi-free-stone. When I asked what this meant, they explained that the pits might not just pop out as with free-stone varieties, but that they were still fairly easy to pit. The moment I arrived home, I washed one of the peaches, took out a paring knife and cut into it. The juice ran down my hand and the sweet, undeniable peach aroma engulfed me. Making another slice in the peach, to form a wedge, the piece of peach easily pulled away from the pit and I popped it into my mouth. Delicious! Seeing how easily the peach was able to be pitted, I fell into a false sense of security thinking that working with these peaches was going to be quick and easy. What I didn’t take into consideration was how they were going to peel. That was an entirely different matter. 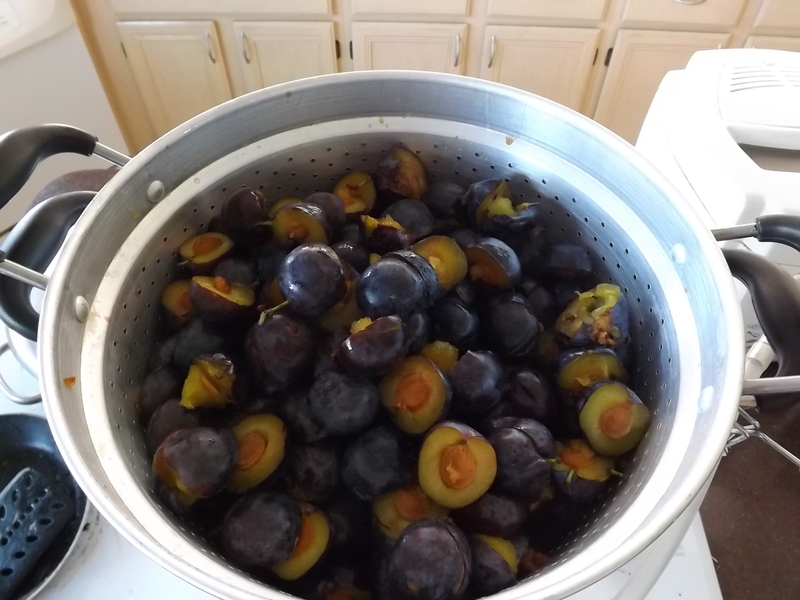 When I boiled up a pot of water and began dipping the peaches and then removing them to an ice bath, it became apparent that the skins on these peaches were not going to release without a fight. 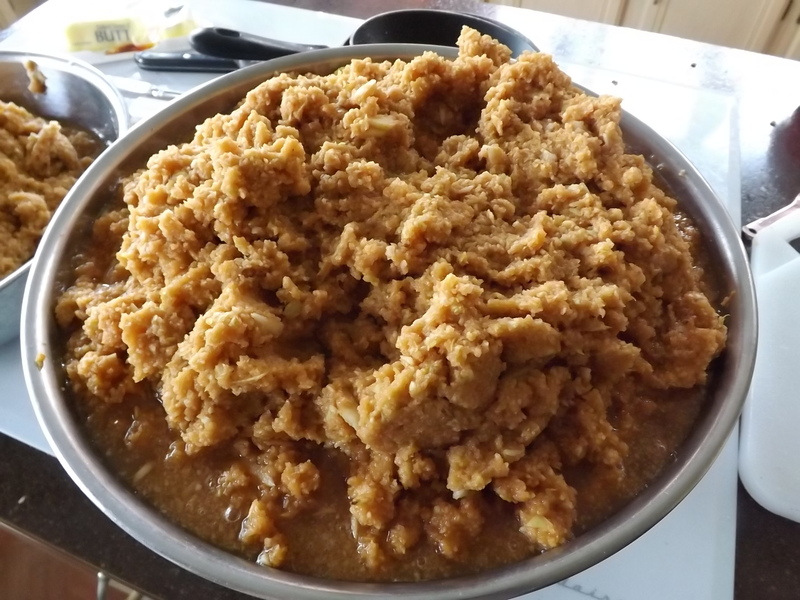 The process of making pie filling was arduous and disheartening. So disheartening that I began to wonder if I really wanted to can anymore than the 7 quarts and 7 pints I spent several hours working on. Pulling a recipe from my binder, I decided an experiment was needed. Taking a handful of peaches I washed them to remove all the fuzzy white film on them. 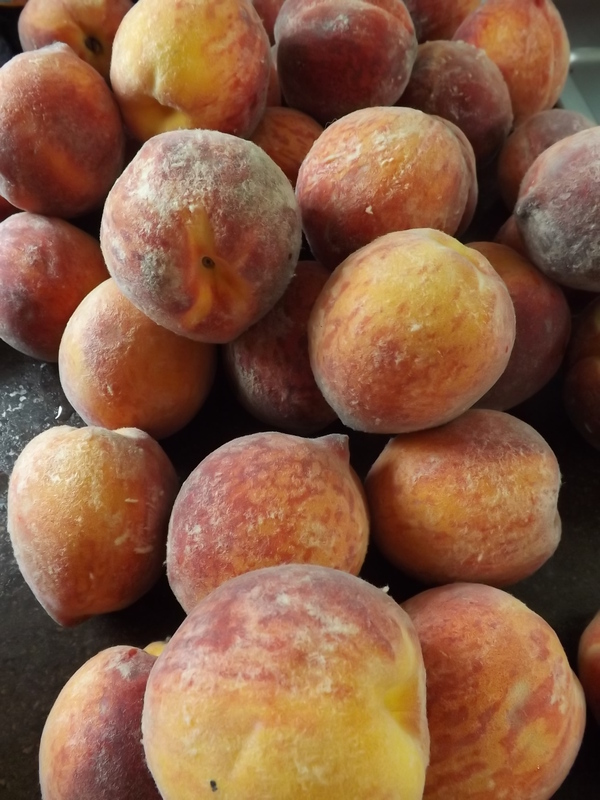 Not sure why store-bought peaches don’t have this fuzzy stuff all over them, but it is one sure way to tell the difference between a fresh peach and a grocery store version. 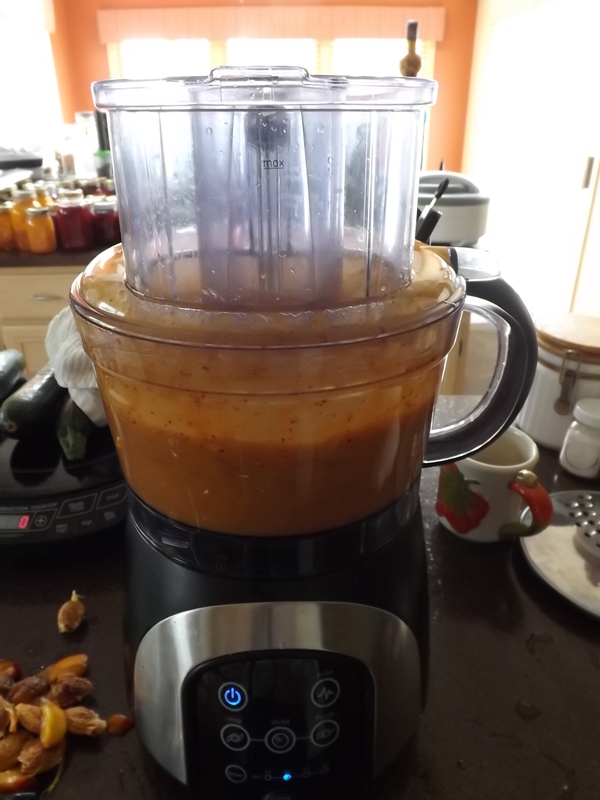 Once washed, I pitted the peaches and put them in my new food processor. It’s not really new, but it is new to me. 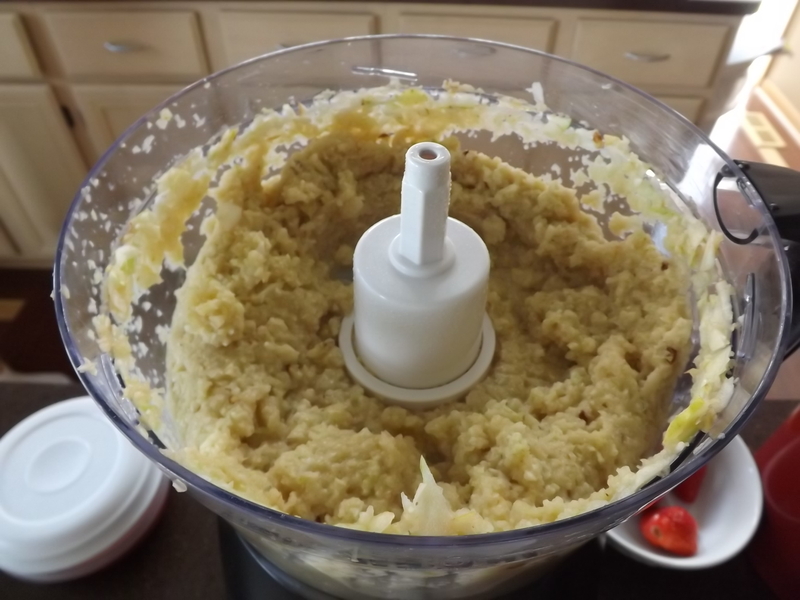 My food processor seized up when I made some fresh peanut butter a few months back so I have been muddling through with a small one-cup chopper since then. 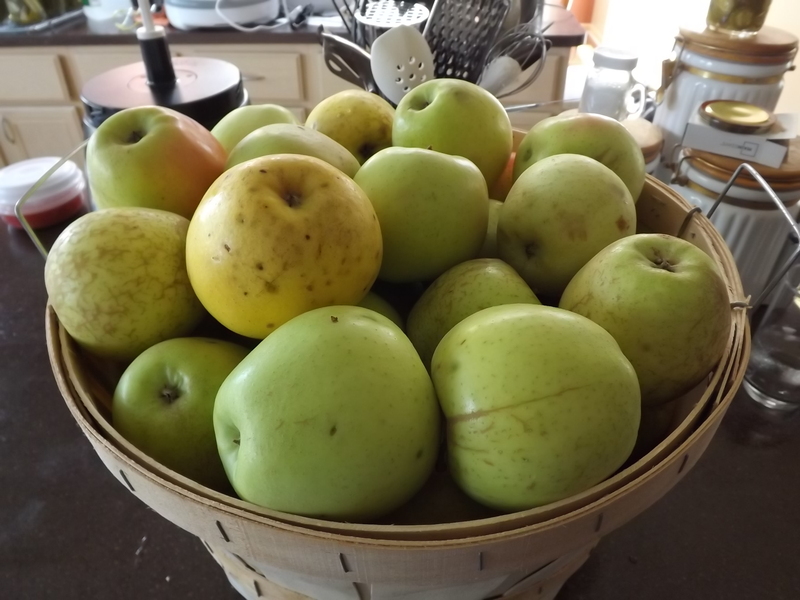 A few weeks ago I mentioned to Hubby that apples were going to be ready in the next couple of weeks and cider-pressing was going to be on the agenda. 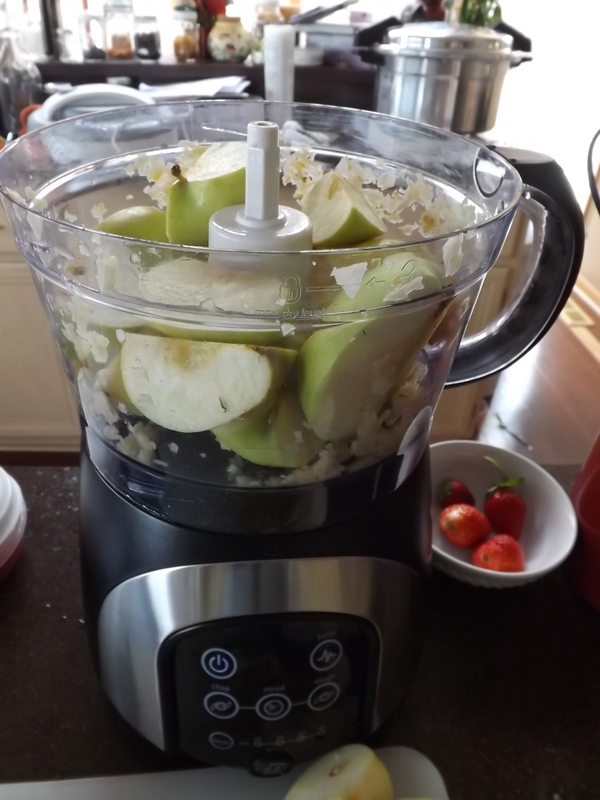 In order to do this, I first need to run the apples through a processor and doing this with a little one-cup chopper was going to be a little inconvenient. He suggested borrowing his mother’s or perhaps using a meat grinder. I was open to both options and told him I’d let him know when the apples were ready. The next day after a visit to his parents, Hubby came home with a huge box. 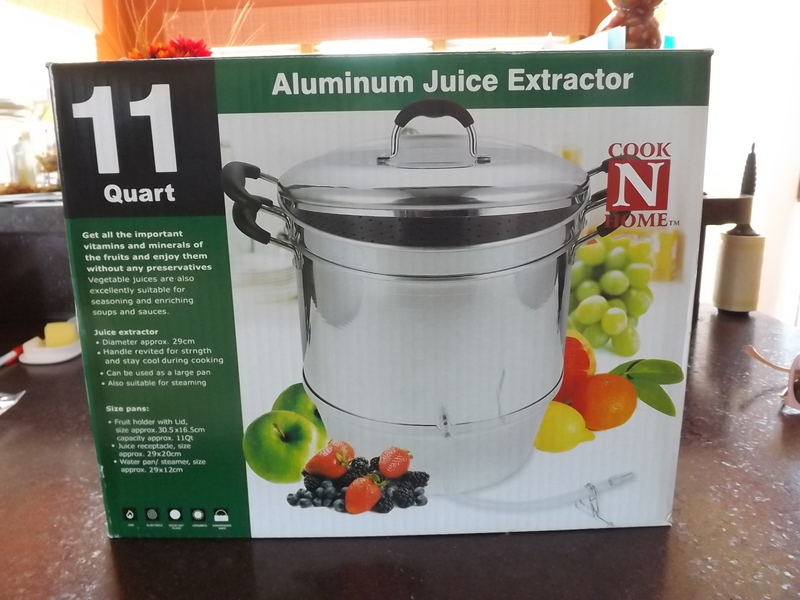 I looked at it and it was what looked like a brand new food processor. He explained that his parents had this on their counter when he got there and couldn’t figure it out. They’d had it for several years and had never been able to get it to work. 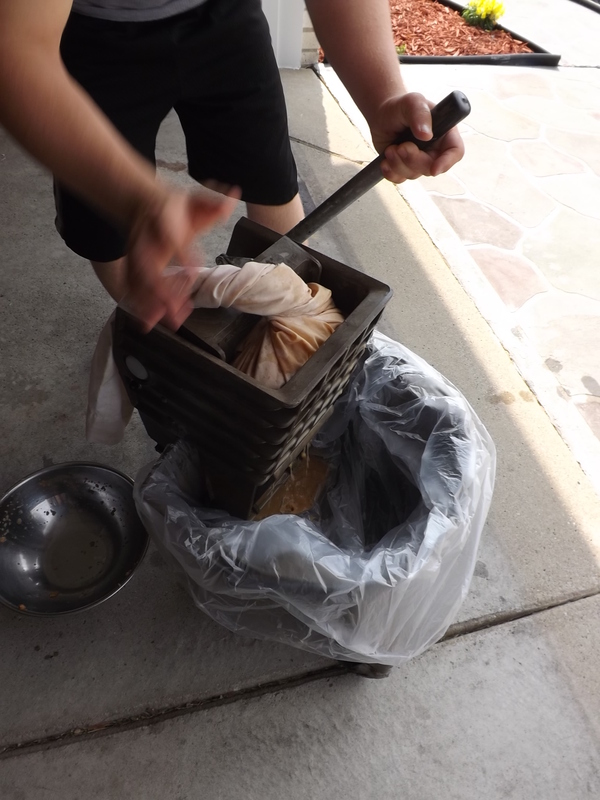 Of course they’d thrown out the instruction booklet, but Hubby gave it a shot. Within minutes he had it working. Still, however, his mother, being in her 80’s now, decided it was not something she wanted to work with. She had a smaller unit she’d been using for years, and was quite content with it, so home it came. Now, I have never “shopped” for a food processor. The ones I have had were either handed down from my grandmother and father, or found at garage/estate sales. So, when this huge thing was removed from the box, I admit, my heart leapt. I couldn’t believe how big it was and the features on it. 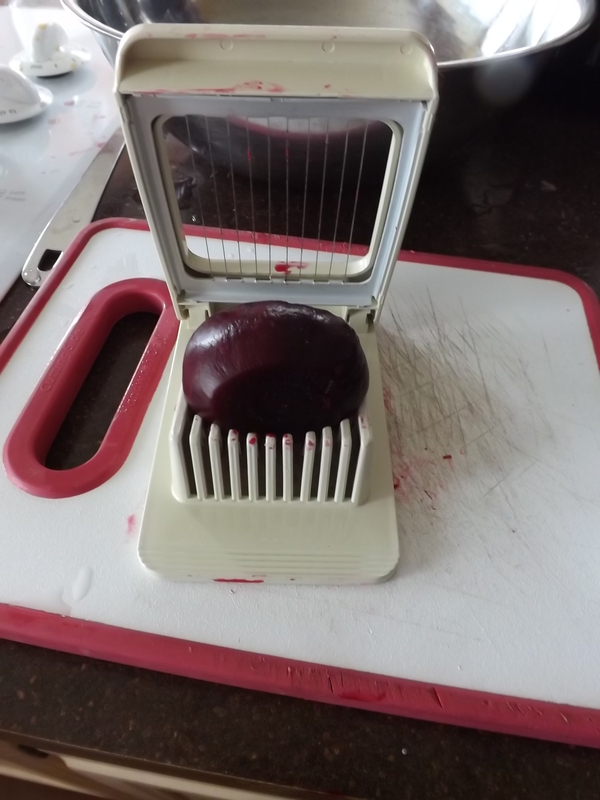 It chops, shreds, slices, has a bread dough attachment, and even has a timer. Could this get any better? Well, yes, yes it could! 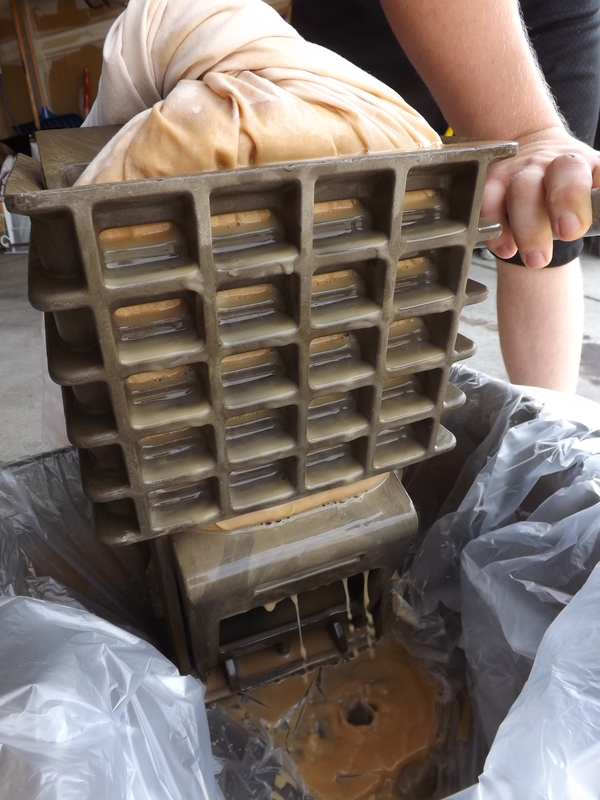 There was also a double shoot on the top that allowed for big chunks of whatever you are processing to be added. 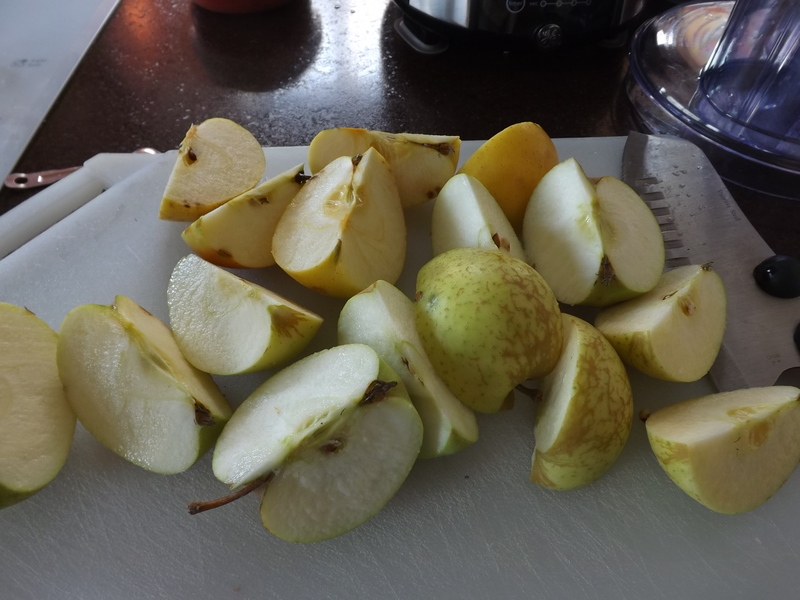 Big chunks like say whole apples or perhaps only halves, but that is far better than having to section them into six or eight pieces. I was thrilled. 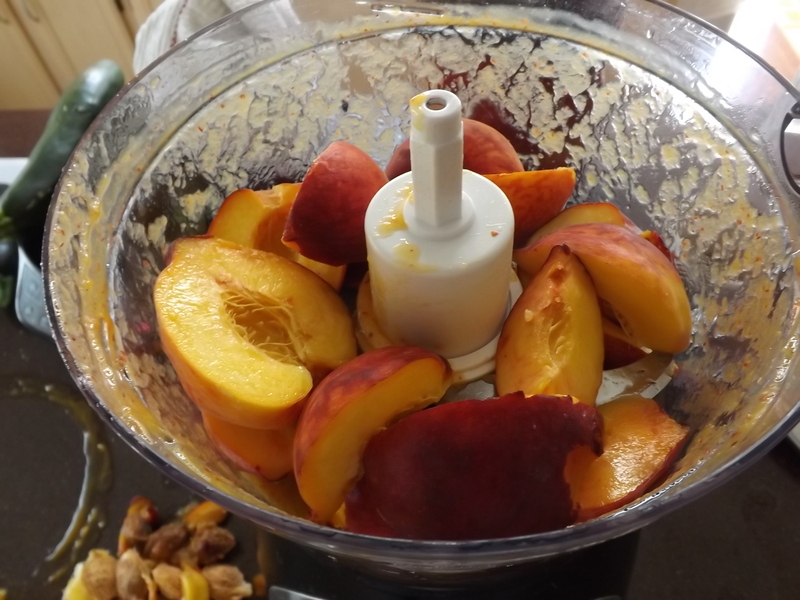 As I pitted the peaches, I put them in the food processor, filling it about half-way. How nice it was not to have to process after each peach like I would have had to do in my little chopper. 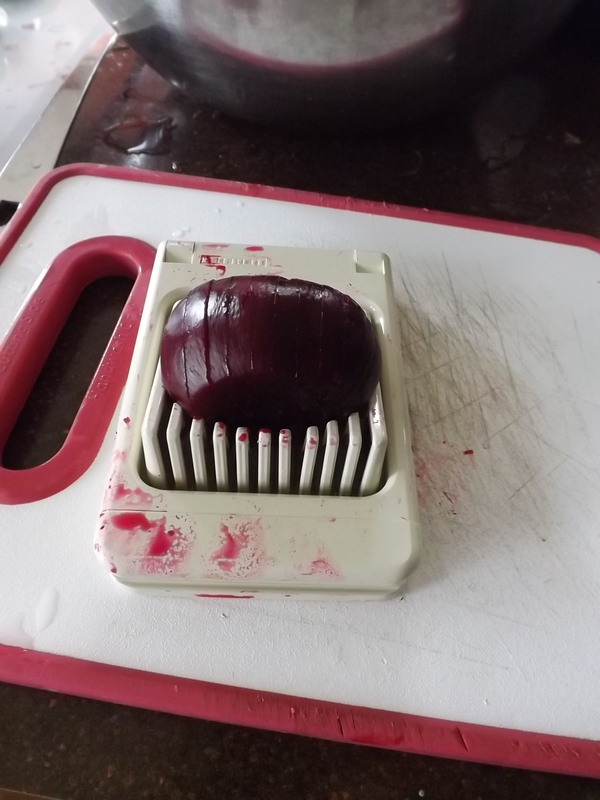 Placing the lid on, I set the timer for 30 seconds and hit the chop button. 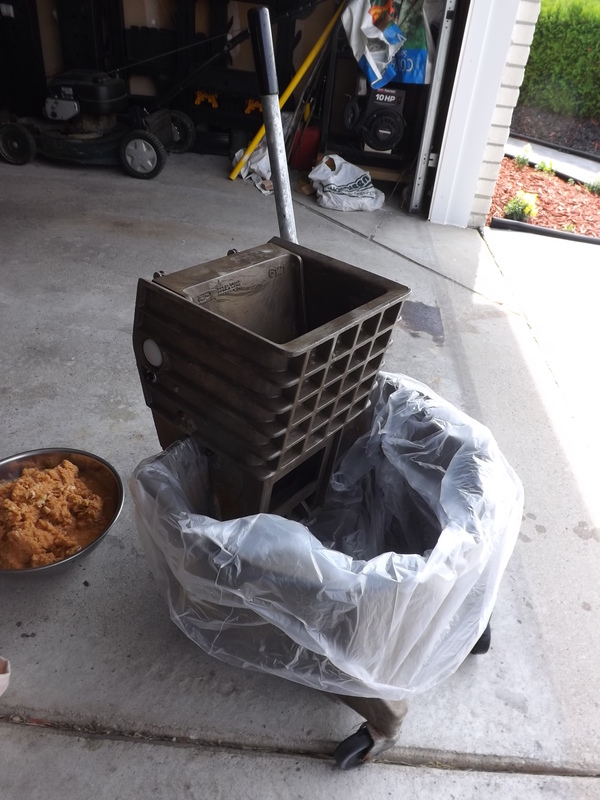 Quickly and quietly this machine-made little work of the peaches. The skins seemed to almost dissolve as the fruit pieces became liquid and turned the golden-yellow a pretty shade of orangish-pink. 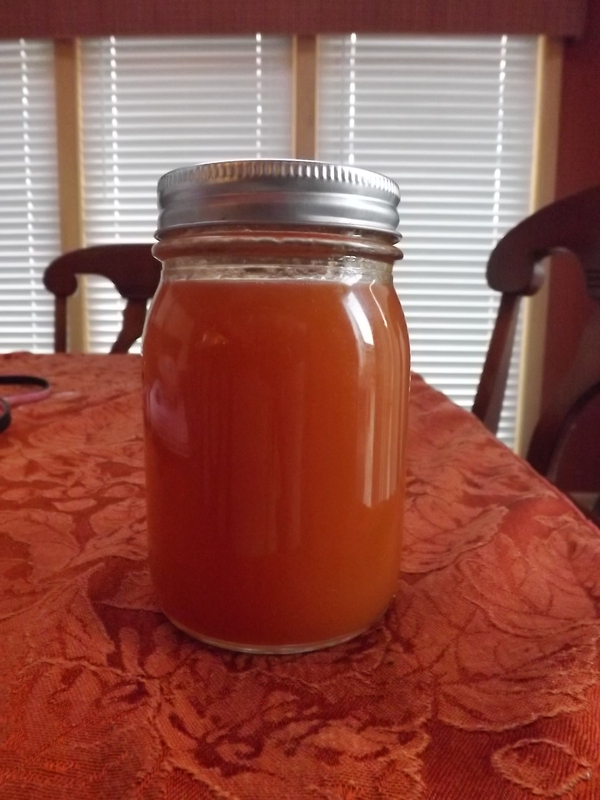 Still, I wasn’t sure if the puree would be smooth enough for what I wanted to try — Peach-Lemonade Concentrate. 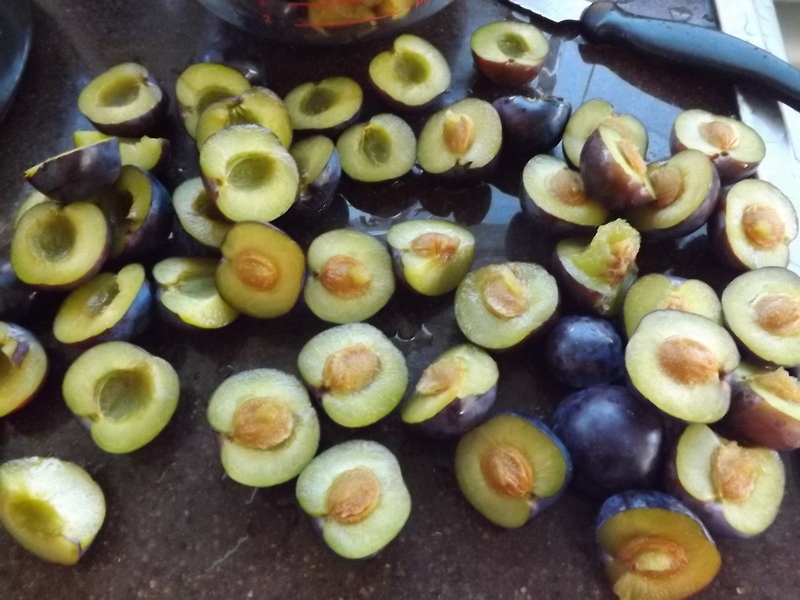 Beginning last year with plums, making fruit flavored lemonade concentrates has become an almost obsession. The kids absolutely love them and when we have company over, it is always a great alternative to serving pop. Although peach-lemonade didn’t sound all that appetizing to me, Gracey convinced me to give it a shot. 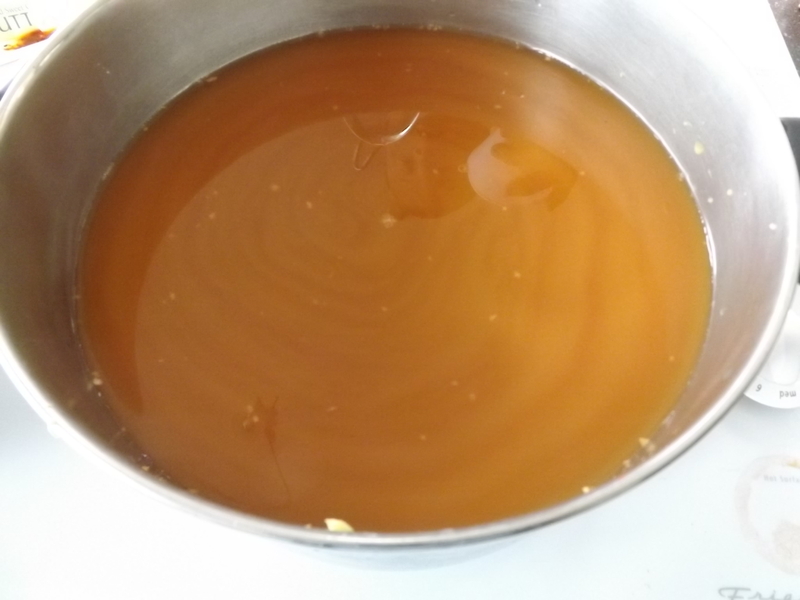 Pouring the peach puree into the stock pot, I added the lemon juice and sugar and began to cook it. The kitchen smelled like fresh peaches as the liquid quickly came to a near boil. Not sure this was going to be a keeper, I spooned out a few tablespoons of the concentrate into a glass, mixed it with water, added some ice and gave it a stir. My official taste-tester wasn’t around, so I had to try my peach-peel-and-all-concentrate myself. The peach flavor was so intense that biting into a fresh peach wouldn’t have been much different. The lemon gave it a bit of zip, but for the most part, it was all peach. Success! And I didn’t have to peel the peaches. The skin had dissolved into the liquid nearly completely, and with just a quick whirl of my handy-dandy stick blender, the concentrate was smooth and silky. When Grace finally returned to the kitchen, after she was sure there were no dishes left for her to be asked to do, she tried the bit of concentrate I had left in the glass. Immediately she asked if I’d saved any to drink or if I’d canned it all. Surprise, surprise! Like I didn’t know she’d want more. Of course I’d saved some and made an entire pitcher for the family to indulge in. 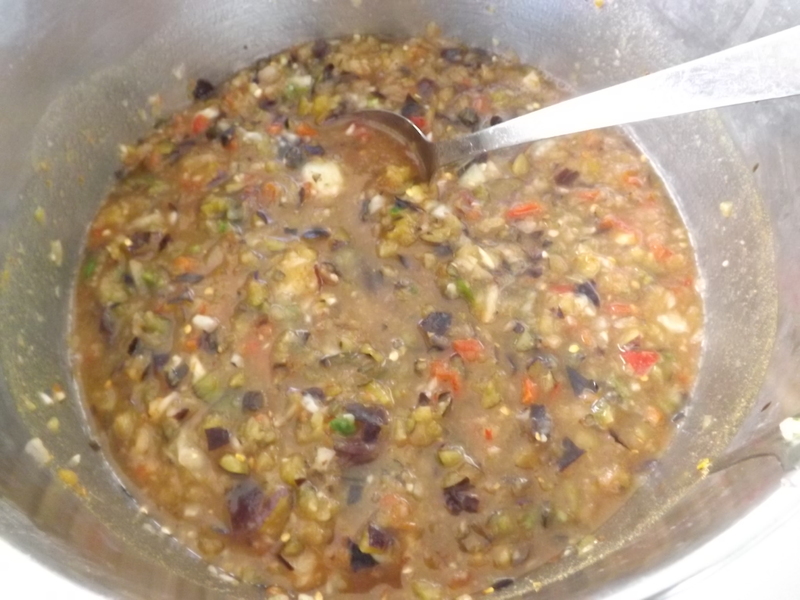 Place above ingredients in large stock pot and bring to 190 degrees. If desired, use a stick blender to smooth out any straggling chunks of peach or peel. 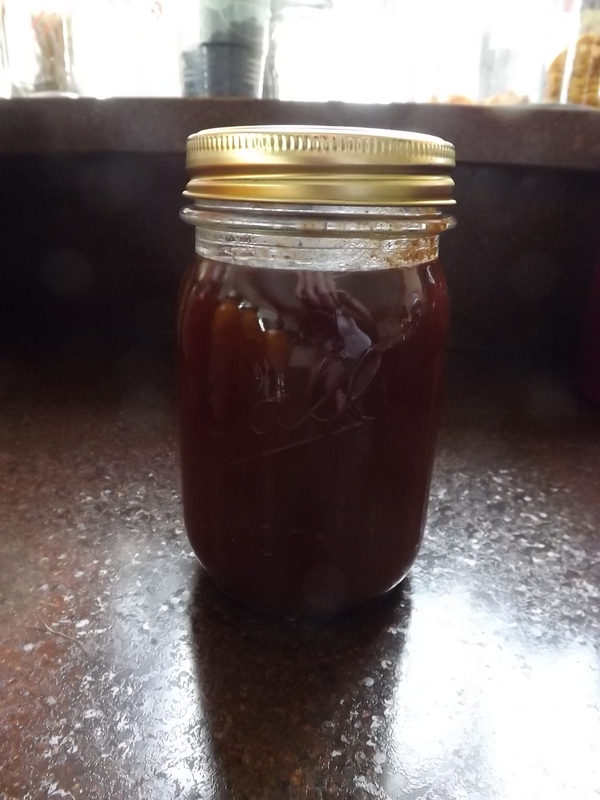 Ladle concentrate into hot jars leaving 1/2″ head space, wipe rims, set lids and bands, and process in water bath canner for 15 minutes. To reconstitute, mix 1 part concentrate to 1 part water, adjusting ratio to your own tastes. I have no idea if this concentrate would be as good without the peel in it and will probably never know because when I can get away with not having to do more work than necessary, I’m going to go with it. I do know that the color certainly wouldn’t be as pretty and a lot of the nutrients would be lost, so for us, leaving the peel in is going to be the only way to go. The brutal winter of 2013/14 took a toll on most of the fruit crops here in Michigan and peaches were unfortunately not spared. Thankfully I was able to find just enough Michigan peaches at a local orchard to make some pie filling and a few other peachy treats. 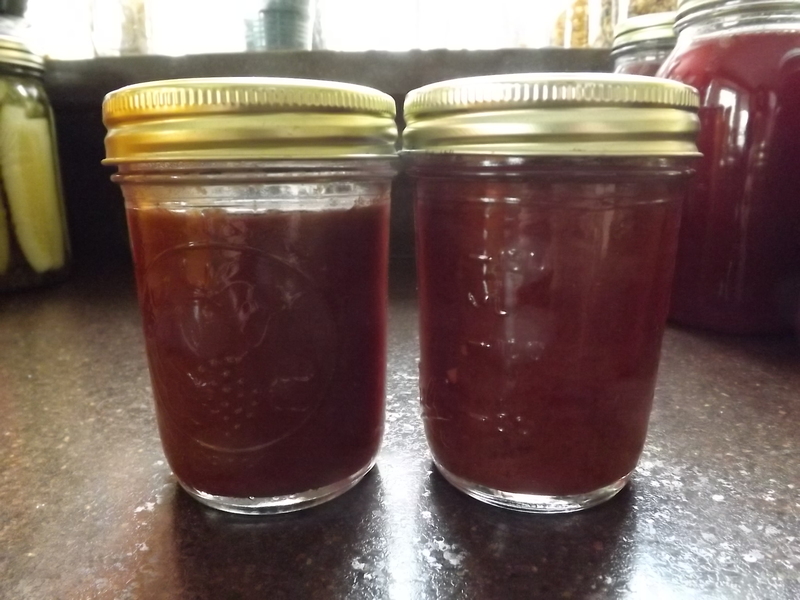 Usually I freeze my pie filling, but this year, thanks to Clear Jel, I was able to can it and free up some much-needed freezer space. Peel, pit, and slice peaches and set aside. 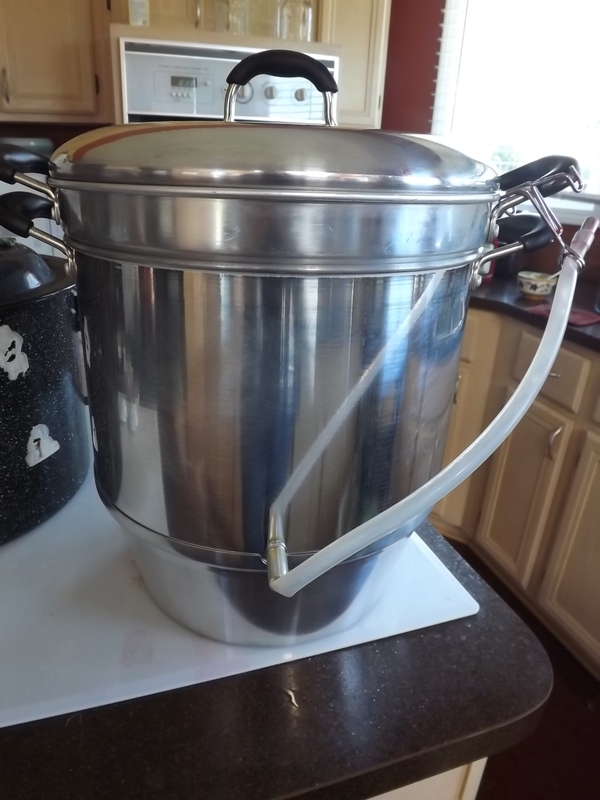 Combine sugar, water, and Clear Jel slurry in large stock pot. Cook over medium-high heat until thick and bubbly. Add lemon juice. Boil one minute. Immediately stir in peaches. 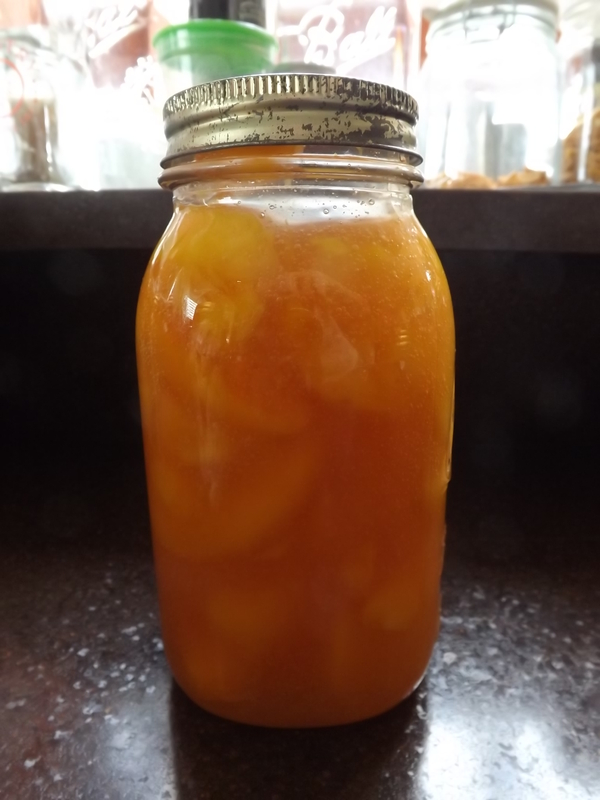 Ladle hot peaches into hot, sterilized jars leaving a 1″ head space. 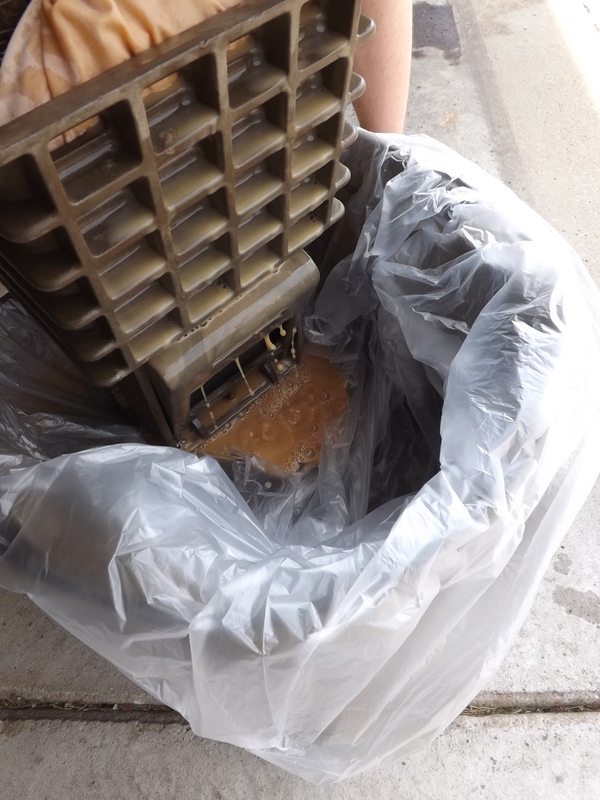 Wipe rims, cover, and process in water bath for 25 minutes. Being able to have peach pie in the middle of winter is going to be a great treat, something the entire family looks forward to. I am so happy that I was able to find even a few Michigan peaches to put up this summer, and for this I am — Simply Grateful.